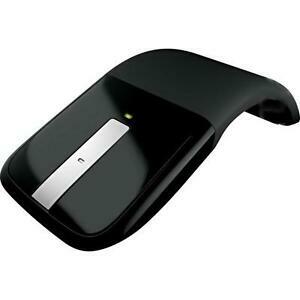 Microsoft Arc Touch Wireless Mouse. Condition Is Used. The Microsoft Arc has a wireless design, which helps you do all sorts of tasks without having to worry about being inhibited by wires that tangle. You can also make use of other accessories, like compatible keyboards and headphones, for a completely wireless experience. The black and silver mouse has a large range, letting you operate your tablets or PCs wherever you are in the house. The technology allows you to control wireless connectivity for up to 30 feet.With a touch-sensitive scrolling wheel, you have all the functionality of wired devices while enjoying freedom of movement and easy maneuverability. These mice also have a lightweight design, making them ideal for use on a small surface such as airline seat trays or small tables. Like traditional mice, the Arc Touch uses two buttons for left and right hand clicking. With a drag of your finger down the metal tab in the center, the mouse will scroll up and down the page. To scroll fast, flick your finger down the tab and watch long text files fly by. The proprietary laser sensor from Microsoft, called BlueTrack, allows you to use any surface, eliminating the need for a pad.This unique product has vibration feedback, which replicates the feeling and sound of a regular wheel. You will know when your finger is no longer on the tab, and will have a more accurate feel when using the unit. The software allows you to customize your experience by turning the vibration off or changing scroll speed. You can also program the scrolling tab to act as a thumb-side button for quick movement with your web browser. It's easy to switch your video viewing on and off, precisely handle a document, or act quickly with responsive gaming.Setting up the Arc is a breeze; simply insert the batteries and connect the USB receiver. To customize the features of the mice, download the software from Microsoft which enables you to change the settings. The receiver is an extremely small size, so it won't get in the way of any other peripheral accessories. While lightweight, the mouse has an ergonomic design with a hand-shaped curve to keep you comfortable.When done using the wireless device, take advantage of the ability to collapse and easily carry the Arc Touch. The mouse's body has a frame inside that can be snapped into either a curved position for use or flat position for carrying. When in the flat position, the power automatically switches off, saving the batteries. The curved position will automatically turn the device on, with no buttons necessary to push. The battery lasts approximately 6 months with regular usage.Compatible with Windows 8 and up, as well as Mac OS X and OS 10.10, the Microsoft Arc Touch is versatile and mobile. With diminutive dimensions of 1.97 x 5.51 x 5.51 inches, these devices are truly portable. This is an excellent mouse. It's really high tech looking and feeling. It uses 2 AAA batteries for power but when you flatten the mouse, it turns off. A quick snap and the mouse ARChes and give you a great feeling as you use it. The buttons were responsive and the center button allows scrolling (although it's a bit tricky to get used to using the center scroll function). However, beware that it requires Bluetooth 4.0 to operate and at least Windows 8.1 if you want to use it like any other mouse. I bought one of these for a friend who just purchased a Windows Surface PRO 4 tablet but was using a USB ARC mouse. That's a problem - there's only one USB port on the Surface PRO 4 and he was tying it up with a mouse. So I ordered him a Bluetooth version of the mouse he loved. To make sure it worked before I gave it to him, I installed it on my Lenovo Thinkpad T430s running Windows 7-64 bit. The mouse loaded up and worked beautifully. I gave him the mouse and he's been super satisfied with it ever since. My son's birthday was fast approaching and he was using a USB mouse on his Lenovo Thinkpad T420s laptop so I ordered him one of these sleek mouses. When it arrived, I once again installed it onto my Lenovo Thinkpad T430s and it worked great, so I gave it to him for his birthday. He tried and tried to install it but it wouldn't work. After a puzzling and extended time trying to figure this out we discovered that this is a Bluetooth Low-Energy mouse and is not compatible with my son's T420s because the mouse requires Bluetooth 4.0 and the T420s is only a Bluetooth 3.0 compatible ... and by the way, you can't install the Bluetooth 4.0 drivers and make it 4.0. All was not lost though because I can use it with my Lenovo T430s, but not so fast. There's still something wrong. I can install the mouse and use it .... until I let a period of time go by without moving the mouse - then it is non-responsive and my laptop doesn't "see it" any longer. I made every configuration change I could to get it to not fall asleep, but nothing worked. So, it's a great mouse - a fantastic mouse - IF you have the right computer. So beware. If you have an older computer, you may want to consider another Bluetooth mouse. I have owned two of these mice so far (several years apart, I bought one again this year because I forgot about the defect I experienced before), and while the mouse itself is fantastic to use and is extremely comfortable, after so many weeks when you're using it, it will intermittently stop responding (even WHILE its in use), and the only way to bring it back is to power it off and back on. It starts happening very often sometimes and is extremely annoying. Two mice in a row bought several years apart suffer this issue and Microsoft can't seem to explain why. Iconic design, great travel companion, but not for long days mousing around. If you need speed and comfort for long days at work, look somewhere else. It is perfectly designed to travel, folding flat and yes, even with a little magnet to hold the USB key. Uncurl the mouse and it turns itself off. Great industrial design, uniquely creative, something rare in the bland world of computing. In other words, a keeper. First time I saw this was at MicroCenter where they had a computer hooked up with this mouse in the demo room. I tinkered with it a few minutes and found out it's a very good mouse to use. This is built by Microsoft, so quality is all there. When the mouse functions as I move it around, clicking buttons, all the commands and movements are as accurate as can be in realtime. I did have a few old logitech mice that I had to get rid of because after some usage, there were delays in cursor movement response no matter how many new batteries I replace. 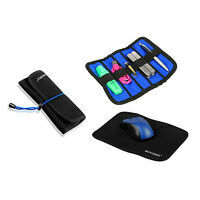 The best thing about this mouse is my laptop bag is very slip so having something flat to store in my bag is essential. This mouse does the trick very well. When I don't need to use the mouse, I simply undo the arch and it can sit in my bag flat with no issues. All of my old mice would create this awkward extrusion on the closure flap in the laptop bag. Not the Microsoft Arc. It's been about a week now and I highly recommend this mouse to anyone. In fact, I'll be looking for an opportunity to buy a spare to give to my wife for her Xmas present. I really like this mouse, so much that I've bought two of them. It flattens for easy storage, has a magnet so you don't lose the USB receiver, and looks really sleek. It does seem to have a few issues with USB 3.0 ports (cursor moving jerkily around the screen, responding sluggishly) so I would definitely recommend plugging it into a USB 2.0 port. The design took a little to get used to but it feels great after a few days. It's a little pricey but I would definitely recommend this mouse for use with a laptop.